You can include your dog or cat's neck size and/or breed or weight as well as any add'l info you'd like me to know for a more custom fit. You’ve reached the limit! Use 676 characters or less. 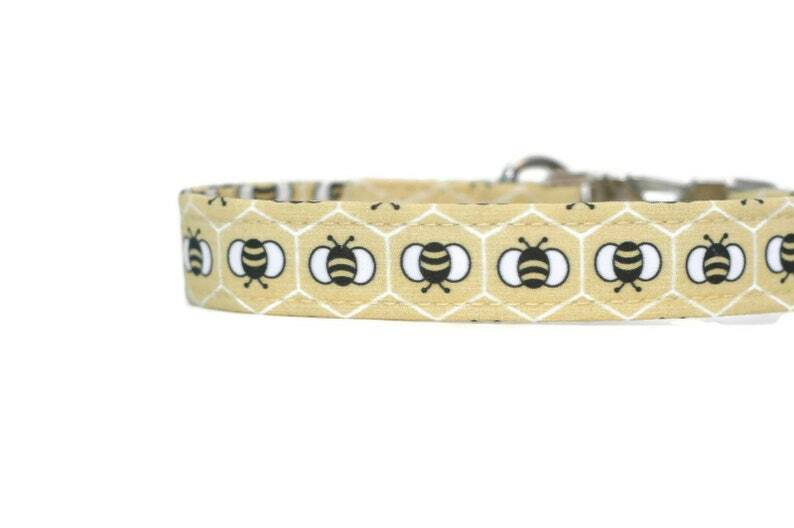 Little bees in a honeycomb pattern on a light yellow background. Example collar shown is 1" wide with a nickel buckle. 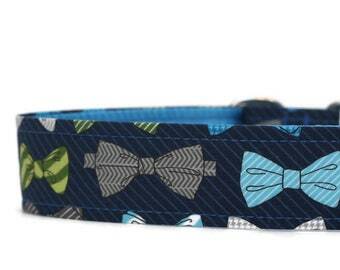 Pattern size and placement may vary, as each collar is uniquely made. 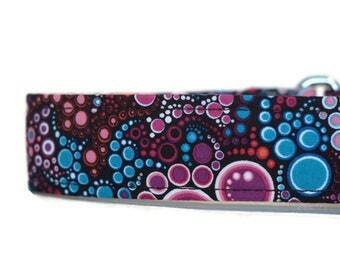 All collars have a strong webbing core, making them practical for strong dogs as well as stylish. If you're unsure, please size up! Including your dog's neck size in the notes at checkout will make sure you have a custom fit. Due to the custom, handmade nature of the product, please allow 1-2 weeks for your order to ship. Your patience is appreciated. PLASTIC/NICKEL BUCKLE - This one is pretty self explanatory. I use only high quality, contoured black buckles and metal, not plastic, slides. Nickel buckles are available on 1" collars. NO BUCKLE- This collar consists of two metal slides and a D ring. 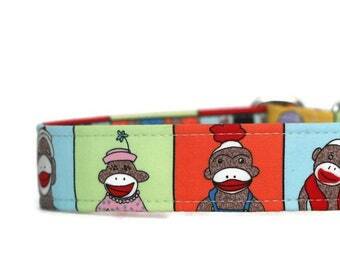 It slides over your dog's head, then adjusts to fit the same way you would a traditional collar. 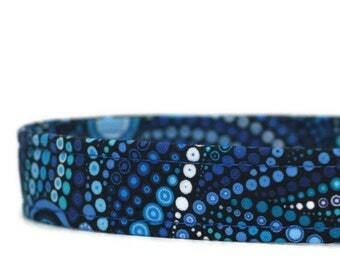 This makes for a very sleek, stylish, comfortable, strong collar with no bulky buckle in the way. I use this type almost exclusively with my own pets and highly recommend them! MARTINGALE - This type of collar has two loops. One goes over the dog's head and a smaller loop containing the D ring for leash attachment. When the dog pulls, the collar gently tightens, preventing the dog from backing out of it. 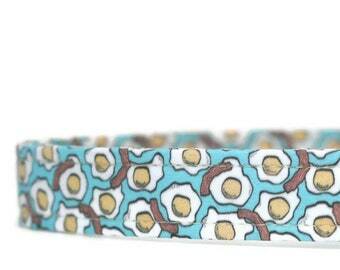 Very popular with sight hounds, it has gained popularity with other breeds. Not to be left on a dog while unsupervised. DOUBLE BAR BUCKLE - A traditional "belt buckle" style collar with 5 grommets spaced 1" apart. An exact neck size at checkout is highly recommended for a perfect fit. 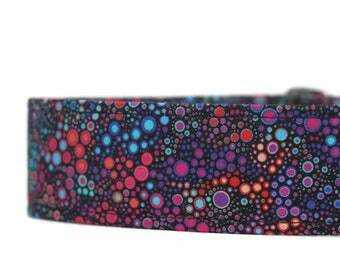 BREAKAWAY BUCKLE: All cat collars are made with a safety, breakaway buckle. This plastic buckle will pull apart if the collar catches on something to prevent the cat from choking. Love the pattern my dog looks so handsome. 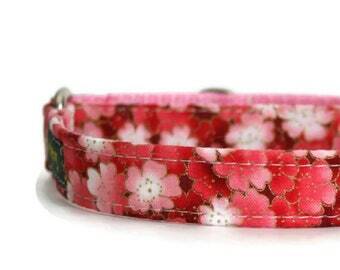 Love Love Love these collars! I have ordered 5 so far. Great quality! My dogs are 100 plus lbs and they hold up awesome!!! Will totally buy more! Item was shipped promptly, came as ordered. Katie loves her collar. It is well made and fits her perfectly. Custom orders are welcome! Convo me with your ideas and we'll see what we can create. 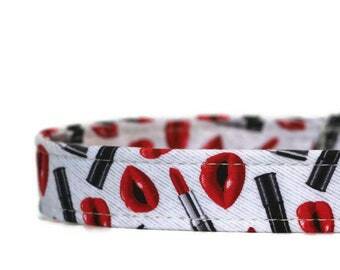 All collars are machine washable. Wash in cold water on gentle. Towel dry excess water off of hardware, then hang or lie flat to dry.